The lines between service, sales, and marketing are blurring. The change in CRM technology to address these three legs of the customer relationship management stool means greater functionality and usability for you. Does your CRM system make the grade? Do you have the functionality you need? Has your team stopped using it because it is difficult to use? Now may be the time to implement a system that has the functionality you need and is easy to use. In this report by Nucleus Research, you will learn which CRM systems make the grade. 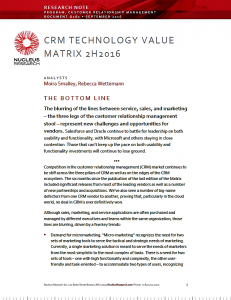 Download the whitepaper, “CRM Technology Value Matrix,” using the form below.